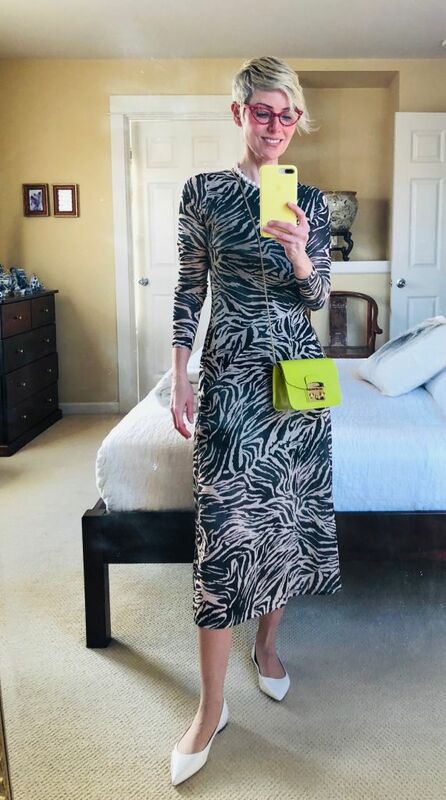 The Topshop Zebra frock came last night. I tried it on immediately and the fit is GREAT. Just the type of structured-fluidity I look for in a dress because I'm off sheaths that are structured from neck to hem. Love the length and it's very comfy. Easy to launder and pack too. The pattern, is brown/beige and not black/cream. That part I did not like for a Spring/Summer dress. (YES, this is a Spring and Summer dress for me). I put it on again this morning to make sure I felt the same way about the print in blazing daylight. And I did. It's too earthy heading into Spring and Summer. I wish the pattern was turquoise and red because I like the fit, style, fabric and price. It's going back because the earthy pattern did not make me happy. Comparatively, the new Summer watermelon dress made me instantly happy (pic #4) - although I have to wait three months to wear it. 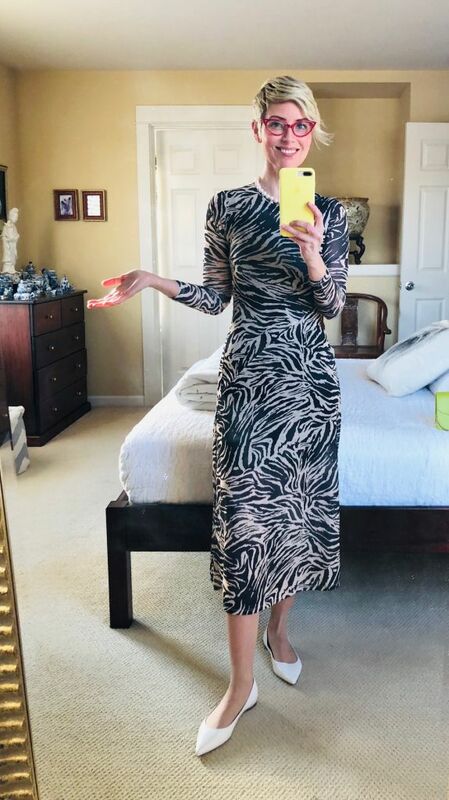 The striped sweater dress - (pic #5) - made me instantly happy, and it's become a workhorse Winter dress. I LOVE those patterns. Listen to how you feel in an outfit. And Sam wants to know what the fuss is about? p.s. New baby citron Furla for Opaline, who wanted to see it. I 100% get it, Angie. Brown and beige is a very different thing than black and white! Too earthy or "muddy" designs don't make me happy, either. I've also learned not to ignore that dissatisfaction. Oh, you do look Amazing. But I get that it’s not you. It’s not Electric for you. Ginger, EXACTLY. You get it. I like earth tones! I need to make them look crisp though, which I feel I couldn't do with this dress - not even with a citron bag, white flats and watermelon specs. How odd! It does not look brown/beige in the stock photos or in your pics, but I understand your feelings exactly. I’ve learned to pay more attention to those reservations I have about certain colors or prints on me when they are close but not quite right. I’m getting pickier, and my closet is reflecting that. Thanks for sharing your photos and reasoning. I pondered that dress for a moment or two, but it would be a fall/winter dress for me. I think it’s too body con for my current weight/size. It does fit you great but I get it completely. Even though it is very breezy dress I don’t consider it summer dress at all. But it is great for visiting friends in their overheated apartments when I don’t have to walk much outside. But it looks black and beige to me, not brown and beige. Rats! It looks like a great fit, but I totally get the 'muddiness' bit. Thank you for the reminder to listen when that little voice doubts. Wow, the website calls it black and white print - misleading! The fit is spot on. Too bad the colors aren’t right. Oh Angie, it is such a good fit on you. But I can kind of see what you mean about the colour. Maybe they'll have the design in another colour later on. Agreeing w smittie-though it definitely looks black and white in pics! How annoying that the colors aren't advertised correctly. I love black, but not brown so much, so it would put me off too. Too bad since the pattern and fit are great on you. The colour and pattern mimics the light/dark in your hair and I'm thinking the brown of your older specs would work. However, I would have trouble getting behind brown for S/S too, so I can understand why you are sending it back. Next! For me it has AlWAYS been how clothes make me feel. No matter if I love it on the hanger and everything else. If it doesn’t make me feel good it will never get worn.. it’s a relationship I have had with clothing since kindergarten....seriously. My mother never understood why I couldn’t wear those socks with those brown shoes ...that printed top with those pants . Etc. I didn’t understand and couldn’t articulate it myself , I just knew it didn’t FEEL right. Hearing that the dress is brown and beige, I jumped on it right away and ordered the dress. These are good colors on me and I'm okay with brown for spring so will see how it looks on me. Thank you, Angie! 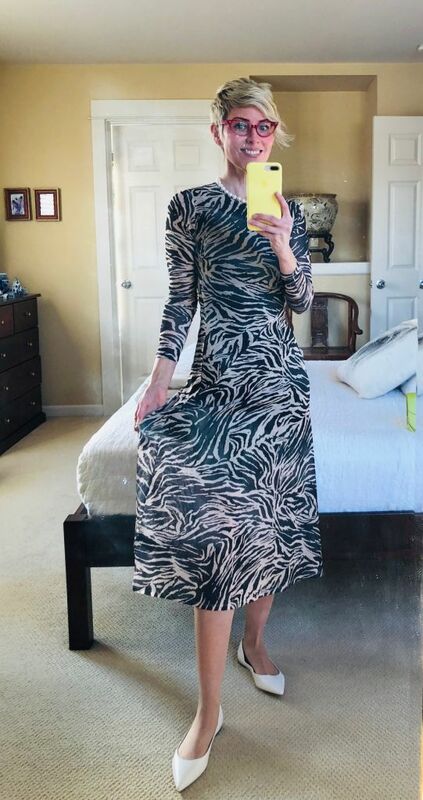 There was no clue that the zebra dress was not black and white. How disappointing. I was considering that dress but also do not want brown and tan but would definitely jump if it were red and turquoise. The fit is great, but I see why the colour does not make you happy for a summer dress.... Thank you for sharing this. It is very helpful to see the pictures of this dress in direct comparison with your favourite dresses. You look beautiful in all of them, but you sparkle in the red one and the blue one. That is an excellent and disciplined example of smart shopping, Angie. Too often I’ve kept things that I really ought to have returned because there was nothing wrong with the piece - it just didn’t make my heart sing. It’s looks great on you but I can see it is not as crisp as your other Spring/Summer dresses (even though it would be a winter dress for me!). Your style is very fine tuned. Good call! Thanks, Lisa P, JAileen, and Sara L, I appreciate the compliments and understanding. Christina, YES. Blue and white could have worked. Smittie, there is another colour - see Find - but it doesn’t look like the pattern would make me happy either. Maybe they’ll bring out another one! Suntiger, darling new pet thanks you. RunCarla, the colours of the pattern do work with my hair - but YUP. Don’t want to do the combo in Summer. High five. Ginkgo, YAY. Hope the brown works for you. JP, at least have a look! Joy, can you arrange a turquoise and red dress for us, pleace? Katerina, aren’t you lovely. Thank you. Kari, there you go. We need Heart-Singing wardrobe items. Brooklyn, thanks for getting it! Can I have your Winter? I'm in a -7C DEEP FREEZE in Seattle at the moment with more snow and ice on the way. 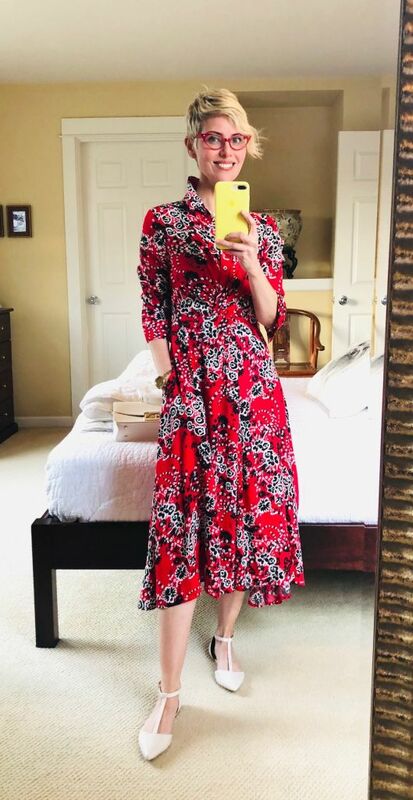 The other thing I think of is that the floral Maggy London midi from NAS - though it has a different cut, print, and fabric - is rather similar in the length, the fit at the waist, and colors, and that one you loved at first sight. YES, Kari. Exactly and good memory. I love that dress and wear it a lot. This is helpful. The fit is terrific, but if it does not make you happy, it's not the right dress for you. I do think the other two are slam dunks. The colour is more vibrant and works with your personal vibrancy. Gosh, I really love that Eliza J. striped one. I hadn't realized it had such a nice flare to it. I know you mentioned that but I hadn't seen you in it.